Today’s singer-songwriters inhabit the world of “Sessions” – the modern equivalent of the folk clubs of the sixties and seventies that gave all the great names their start – safe havens to develop their craft, try out their songs and play original material to a listening audience. Since I returned to music two years ago I’ve played, on average, two or three times a week at a whole host of regular and irregular sessions in Dublin and beyond – all of them are hugely enjoyable events, run by people who are immensely committed to providing a platform for people to express their art. Each has its own characteristics and quirks and over time I’ve looked carefully at what I most like about each of them, imagining what my idea of an ideal session would be. Brunch time on a Sunday appealed to us as a time where musicians and people who like music were likely to be free and could be attracted to somewhere they could play, listen to others, enjoy a drink or a coffee or a nice brunch and relax in a “musicians’ club” atmosphere. There’s no admission charge and, given the time of day, it’s family-friendly – people are very welcome to bring children with them to expose them to the magic of live music. Each week there are two featured artists who get to do a set of around 20 minutes. The host also does a few, and there’s room for 8-10 other participants to play a song. 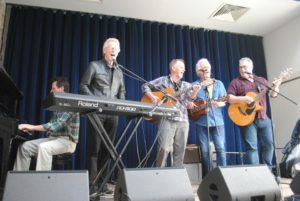 The gig always ends with a closing jam where those who have played are welcome to join us on a few well-known songs – as shown below. We’d love the Songbrunch to become a long-running fixture on the Dublin music scene. Whether or not that happens will depend on whether we can grow the attendance, which has been respectable so far. Certainly everyone who comes seems to really enjoy it, so here’s hoping! If you’re interested in the Sunday Songbrunch, there’s a Facebook Group which has all the information you need – here – you’re welcome to join the Group so you’ll get the updates. It’s great to be back in the Studio!